The tower structure was built to commemorate the centenary of the State of Victoria in 1934. As part of the State of Victoria`s celebrations, the City of Camberwell laid the foundation stone for the Centenary Observation Tower on the 4th November 1934. Cr. Nettleton stated at the meeting of Camberwell council that the £800 required for the erection of an observation tower in Beckett Park, Balwyn, intended as a permanent Centenary memorial, had been subscribed, The council was now asked to permit its engineer to confer with the architects regarding the plans for the building. 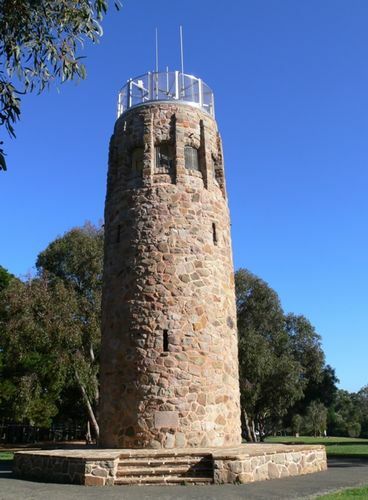 The tower, towards the cost of which Camberwell Council has contributed £400, is to be placed at the highest position in the park, which itself is on one of the most elevated pieces of land around Melbourne. It will command unexcelled views of the Dandenongs, Mt. Macedon and distant ranges. Final arrangements have been left with the Centenary celebrations committee, which originated the scheme, and tenders for the work are to be called at an early date. Age (Melbourne), 11 November 1936. Councillor R. B. Barnes, J.P.
Cr. J. H. Nettleton, J.P. S.M.